Chronic stagnation of qi and blood in the upper burner, including the chest, epigastrum or head. Chest or costal pain accompanied by restless sleep, palpitation, dizziness, irritability or depression. Chronic stabbing headache and oppression in the epigastrum causing belching and prolonged hiccoughs or choking sensation. Congestive heart disease, angina, arrhythmia and head trauma, epigastric constriction or reflux, stomach ulcer and hypertension due to blood stagnation. Preventative against stroke are some of the imbalances satisfied clients have used this product for. 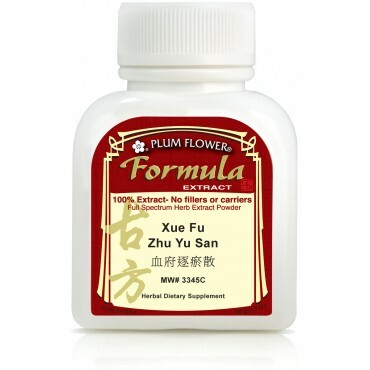 Prunus persica seed, Carthamus tinctorius flower, Angelica sinensis root, Rehmannia glutinosa root-raw, Achyranthes bidentata root, Citrus aurantium fruit-ripe, Paeonia lactiflora root, Ligusticum chuanxiong rhizome, Platycodon grandiflorum root, Bupleurum chinense root, Glycyrrhiza uralensis root. - Tao ren, Hong hua, Dang gui, Sheng di huang, Huai niu xi, Zhi ke, Chi shao, Chuan xiong, Jie geng, Chai hu, Gan cao.